I'm passionate about writing the West, and if you've read even one of my books, you know how I feel about coyotes. I think they're a wonderful part of the West. One of my favorite sounds is their singing on summer nights. The book I'm working on features coyotes (or wer-coyotes) accused of attacks on humans. My research and personal experience indicate coyotes are extremly shy of humans. Although coyotes would consider my yard a well-stocked pantry, for all my watchfulness, I've never seen one after fawns, quail, chickens, cats or dogs. They're that shy of humans. According to recent news,though, Canadian singer Taylor Mitchell, was attacked and killed by two coyotes. I'm sad for a young woman who, according to her friends, loved Nature. Such an attack is so unusual, I find myself thinking of fictional explanations or some encounter gone terribly wrong. In most states, there's already a continuous open hunting season on coyotes. Keep your eyes open for the facts. Yesterday I drove past two animal control trucks. Parked on the bridge near my house, they had their flashing lights on, but were looking down at the river, kind of casually. I actually drove past them twice -- going into town & coming home. And the second time a few people were gathered around, but I didn't stop. Why? Was I pretty sure they had things under control? Did I resist giving whatever animal in distress one less human to worry about? Was I too heartsore with horse worries to add another creature? My answer is yes, all of those, but want to know what I missed? A happy young bear had climbed up a riverside apple tree to have a snack. I wish I'd seen him before he ambled off on his own. Today you can have your own WILD HORSE FILM FESTIVAL. Fun with a serious purpose. Right this minute: you can watch the first two parts of STAMPEDE TO OBLIVION. 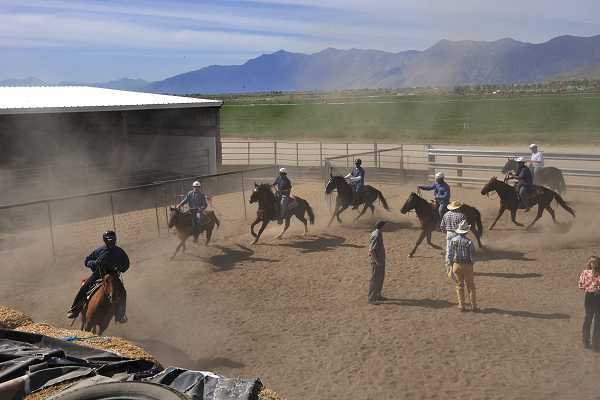 Tonight: watch ( click here for local listings in the U.S.) CLOUD: Challenge of the Stallions. It will be followed by an online discussion with Ginger Kathrens about the BLM round-up of Cloud's band. STAMPEDE TO OBLIVION includes everything from proof that the horse is native to North America to BLM's rough treatment of foals, to-the-point interviews and up-to-the-minute news reports from a top-notch investigative reporter. Click here Stampede to Oblivion to watch it now. When you see the screen in the upper right hand corner of the page, look under the picture and on the far right, click on the icon that looks like a TV. That will blow the movie up to fill your screen. If you prefer, address envelopes or postcards, have them at hand and write notes that you can mail tomorrow. DON'T ASSUME SOMEONE ELSE WILL SPEAK FOR THE HORSES; THEY NEED YOU. Want a weekly update on authors visiting your area? Go meet them, look at and discuss their books. If they're not too busy, maybe even talk about the life of a working writer. 3. Then, look to the left of the page for HOW TO USE BOOKTOUR, click there and on the next page, look down and you can find a place to arrange for a weekly email update of authors in your neighborhood! 1st man - We lost our horse. 2nd man - Why not put an ad in the newspaper "lost and found" column? 1st man - Don't be silly. He can't read. Stable owner - Did you find my horse well behaved? Rider - Definitely. Every time we came to a fence he let me go over first. How do you hire a horse? Put a brick under each hoof. No wonder BLM has barred humane observers from their round-ups. Over the last two years a total of 205 horses have died at the agency’s hands during its gathers to thin the herds despite the vastness of the lands managed by BLM..
--The bureau classifies equine deaths two ways, according to national spokesman Tom Gorey of the agency’s Washington office. BLM claimed 106 of the 126 deaths fall into the latter category. Trying to get the burro photo up! I promise it will be a nice surprise when I do. Writing Children's Books: GWP's Fall 2009 Three-Part Series Continues! October 17th at 1:30 p.m. - Terri Farley, author of the popular Phantom Stallion series presents "Hooked on Horses" for kids at 1:30 p.m., followed by a wild horse video for both kids and adults at 2 p.m. Farley will discuss the writing life and her love of horses, then hold an opening line contest at the end of her talk. Many of us question WHY Secretary of the Interior Salazar proposed the purchase of seven wild horse "preserves" in the East and Mid-West for about $96 million when 19.4 million acres are already designated as home to wild horses and burros. "In just the past few weeks, 12 herds (620 horses) were zeroed out on an additional 1.4 million acres in Eastern Nevada. 'It would seem that the best use of taxpayer dollars and the most humane plan for the nearly 32,000 wild horses in government holding would be to return them to their native lands,' says Ginger Kathrens, Volunteer Executive Director of the Cloud Foundation. 'These millions of acres were identified for use by wild horses and burros and these lands are already owned by the American public.'" That's right, not drugged horses. These horses were, at first, accompanied by people, but one of my son's friends who works at the border told him some animals are trained to make the drug runs alone. Remember Jake's interest in the Native American tracker team called the Shadow Wolves? For those of you who think I've forgotten the PHANTOM STALLION books, let me tell you : the ideas never stop! "I can make a General in five minutes but a good horse is hard to replace." This pretty boy is from the West, but closer to some of you in the East. Had to share just in case one of you is looking for a beautiful new horse! For Adoption to loving home, "Flax", is a two year mustang gelding. Originally adopted as a yearling form the Bureau of Land Management (Capture state Oregon). Flax is at present 13.3 hands. He should finish as a large pony. He is totally gentled, loves grooming, leads well, crossties and is great for both farrier and vet. Seeking a nice home to continue his education. Please call 973-219-3386. Wow! Your enthusiasm about a Breyer Phantom is fantastic! I'll keep poking around for information, but if any of you have come upon a list of past Benefit horses, please let me know! I'm going to be at a writers' conference all weekend, so I won't be writing to you, but I have a huge favor to ask! One of my readers, BRILLIANT Elizabeth, had an outstanding idea. She suggested that we contact Breyer about making a model of the Phantom and having him be the BENEFIT HORSE OF THE YEAR --- to spotlight the M U S T A N G S !!!!!!! If any of you have time to do research on this, please share with me! 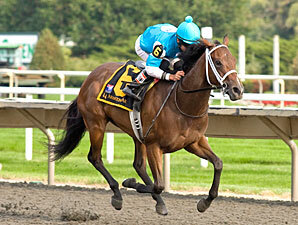 Most importantly, I know Breyer has done mustang models, but have they ever done a mustang Benefit Horse of the Year? If not, it's soooooooo time. This is a way we can all help the horses! Everything I've read about the Dept. of Interior's wild horse preserve is worrisome. Horses on the range and in preserves will be, for the most part, "non-producing" -- wild stallions will be gelded, mustang mares will get birth control shots. It doesn't take a biologist to know what that means: one by one, wild horses will die, and then they will be gone. A Nevada newspaper would like to know if you think the wild horses should be taken away from their homelands. I was feeling pretty glum this morning until Crystal in Australia posted this beautiful horse on Facebook! He reminded her of Mistwalker. Me, too! What I'm hearing about Secretary Salazar's plan is unsettling and has contradictory numbers. More later, but til then I wanted to show you a race horse whose name I love. Another home off the range? I'm waiting for details on this news story: Sec. Salazar proposes moving West's wild horses and I'll tell you what I know, as soon as I know. > I want to hear the Secretary's definition of a preserve. Is there a reason he didn't say sanctuary? This plan definitely puts a roadblock up for BLM's "silver bullet" plan to slaughter the wild horses already in captivity. And that IS a good thing. Although BLM claims they can't afford to feed the horses they've already captured, they have post-Christmas plans to end more free lives. Take a look and see if they're coming to a wild land near you. I met Willy and Torsten (and Rusty)during a wild horse adventure which will be the basis of their new book. They graciously shared some of their photos with the Lucky Horse Project folks and they've been compiled into a photo journal. There are lots of pages! Don't miss any! And when you're done, tell me which of these three mustangs you'd pick for your own -- If you had your choice of Rusty, Pac Man or Tahoe. It's a crisp October morning in my part of Nevada, and one of the horses I feed each morning -- a pinto named Darlin' -- is bucking and kicking up her heels and tossing her head in the direction of the bucket I used to bring apples from my tree. Very cute, but she's had enough, so I'm writing to you instead of finding her some more. Good thing the tree is out of her reach! Hope you received your October newsletter last night! Next month I'll be early. Promise. Three horses confined in BLM corrals were shot to death by Jason Hein, a BLM employee charged with caring for them. Synecdoche is a figure of speech which uses part of something to stand for the whole thing. This news item isn't a perfect synecdoche, but it's tempting to think of this guy and his murder of penned animals as standing for the BLM and its actions toward our wild horses. Read on if you have the stomach for it. ROCK SPRINGS, Wyo. (AP) - Officials with the U.S. Bureau of Land Management say a BLM employee has been arrested in connection with the June shooting deaths of 3 wild horses as the agency's holding corrals in Rock Springs. BLM spokeswoman Lorraine Keith says Jason Hein was arrested in Billings, Mont. on Friday. Keith says he is being returned to Sweetwater County to face multiple charges. Hein has worked for the BLM for several years, and Keith says he is currently on administrative leave. 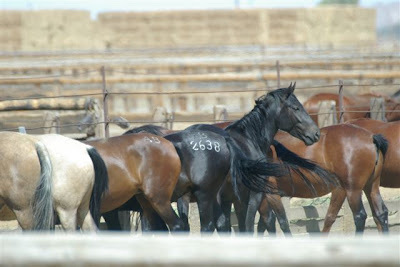 BLM workers discovered that the horses had been shot when they arrived at the corrals on June 12. 2 of the horses were privately owned, and the third was a wild mustang that was part of a BLM roundup and was being offered for adoption. People (even other writers!) often ask me to show them an example of this coat color. How would you describe the color of this frisky horse?